Running, for me its embedded deep in our DNA we are designed to do it, we are all capable of running huge distances across counties, countries even continents it might seem. But yet (not a rant at you all) this community of runners seem to play it safe, routes around home repeated, loops taking us back to safety . Marathons even, people with huge abilities line up in the thousands in the safety knowing that you’ll have water stations and a set finish line, a point of home. We’ve regularly seen on social media day after day week in and week out people knocking marathons out with no seeming point other than the goal of the finish a medal and to say that’s another one in the bag. The sudden uptake of 24 hour ultra races ran around a 5-10K loop over and over again never seemingly going anywhere. This has interested us and brought about this trip to explore this mindset of running in some relative comfort a finish point a knowing an end to each race. How would it make us feel to only have a direction to run in and the knowing that after a number of days running over and over with no place of safety we’d reach our finish point. How would this effect us mentally, could we cope with the knowing that running is our transport its our journey this is whats important, not finishing, that will happen yes but its us being fully submerged in the daily act of running embracing it like never before and relying on this sport we love to propel us back home. What are we doing you might be wondering? Paris to London, seemed the obvious choice to us! Cheap train tickets, £35 to be precise, and the ferry across the channel £25, that’s £60 excluding food and drink. Its around 170 mile route from Paris to London we are following the shortest cycle route option which see’s us head 110 miles to Dieppe, cross the drink and then the final matter of 60 miles to Central London. So we packed and we packed! That’s all my kit for six days running including what i’ll run in, yes I wont smell lovely but then I rarely do these days. Camping is our choice of shelter and eating when we see shops is the plan. We’ll be filming on route and doing some interviews seeing how this makes us feel day by day to explore and delve into whether our love for running can keep us motivated to get up each day and run 30 miles, how our broken bodies can cope with having to function beyond what we normally might do after running such distances. When do we go, how long will it take? 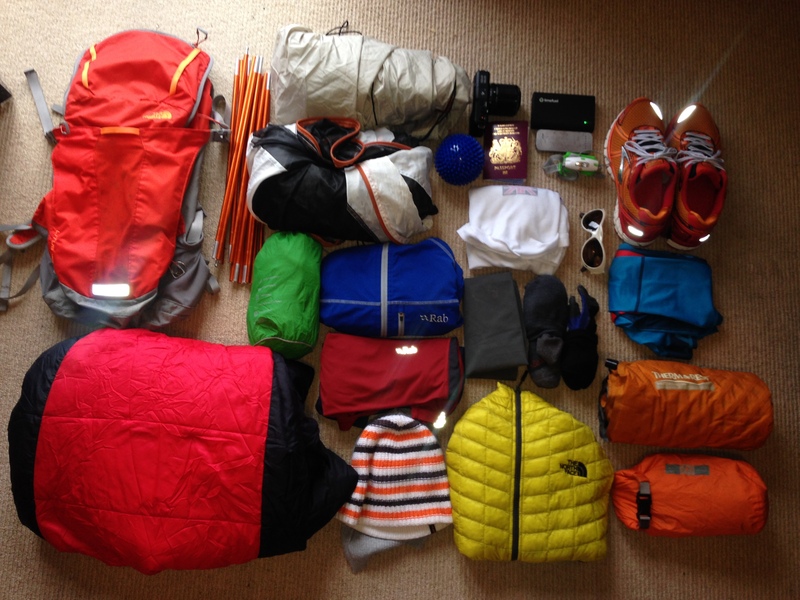 We leave at 5AM tomorrow with the intention to start running by lunch UK time. 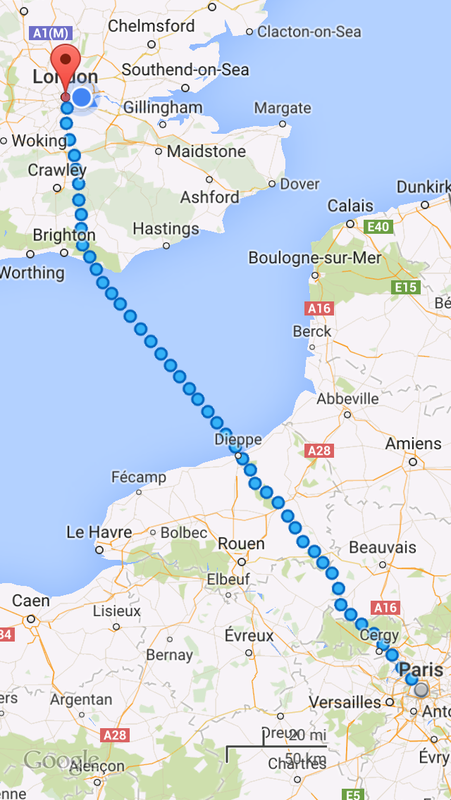 The french part of the run will take 4 days (110 miles) the remaining 60 miles will be from Newhaven. We finish on Bank Holiday Monday in Trafalgar Sq around 3pm and will be gong for a celebratory beer should you want to join us. As for following the story unfold I’m on Twitter as @russ79smith and Jana is @janams10 we are also going to be tweeting with the hash tag #Runhome so you can check that out for updates too..
Whats left for us to say? Well, it is bank holiday coming up and you have all the chance you’ve ever needed to get up and out to go for a run, but why not try something different, leave the watch, don’t follow a route or ask a loved one to drop you off further away from home than you’ve ever ran before and leave yourself no option but to make it. For us we both hope to find another level to our running and to be using it as a form of transport a relaxed timeless time to just enjoy and be at one with the run without any time pressures, and to explore physical boundaries, when we get this finished and have recovered the question will be whats next, and how far can we go. We run because we enjoy it so surely this should be an enjoyable 170 miles, I guess there’s only one way to find out..